Hide this Project (Sukhwani Palms) Discover properties in other projects by hiding the ones that doesn't interest you. You won't see them in your searches further but you can unhide anytime later. Hide this Dealer (Genuin Home Solutions)Discover properties by other dealers by hiding those whom you have already spoken to. You won't see them in your searches further but you can unhide anytime later. Hide this Dealer (Avinash Jadhav) Discover properties by other dealers by hiding those whom you have already spoken to. You won't see them in your searches further but you can unhide anytime later. Hide this Dealer (Manisha Tade) Discover properties by other dealers by hiding those whom you have already spoken to. You won't see them in your searches further but you can unhide anytime later. Hide this Dealer (Sahebrao Yewale) Discover properties by other dealers by hiding those whom you have already spoken to. You won't see them in your searches further but you can unhide anytime later. Hide this Dealer (Vivek Ansingkar) Discover properties by other dealers by hiding those whom you have already spoken to. You won't see them in your searches further but you can unhide anytime later. Hide this Dealer (Vijay Mahale) Discover properties by other dealers by hiding those whom you have already spoken to. You won't see them in your searches further but you can unhide anytime later. Sukhwani Palms, located in Pune, is a residential development by Sukhwani Promoters. It offers spacious and skillfully designed 1BHK and 2BHK apartments. The project is well equipped with all the basic amenities to facilitate the needs of the residents. The site is in close proximity to various civic utilities. Located in south Pune, Wagholi is a developing locality of the city. Wagholi has a number of upcoming projects that are available at pocket friendly prices. Because the locality offers affordable residential solutions, the demand in the locality comes from IT professionals. The locality has a well-developed and posh neighborhood. The area is well connected to Khandala Loni Road connecting it to other parts of the city. The locality also has good infrastructure that further smoothens the connectivity. What is the location of Sukhwani Palms?The location of the project is Wagholi, Pune. What is available flat size in Sukhwani Palms? 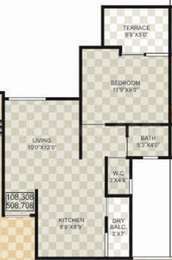 Flat sizes in the project range from 595.0 sqft to 1001.0 sqft. What is the area of 1 bhk in Sukhwani Palms? 1 BHK units in the project are available in a size of 595.0 sqft to 607.0 sqft. What is size of 2 bhk in Sukhwani Palms? The area of 2 BHK apartments ranges from 904.0 sqft to 1001.0 sqft. What is the area of Sukhwani Palms?The total area that the project occupies is 0.64 Acres. How much is price of 1bhk in Sukhwani Palms? The project offers 1 BHK units within Rs. 2600000 to Rs. 3500000. Hello Pritam, Are you looking for an apartment in PCMC? Is it for residing or investment? can anyone tell me about this project?How is it? Is it a good builder? @pream there is no issue investing here as the project has got all the required approvals and for loan purposes you can contact DHFL.